Greetings from sunny Florida. You know you’re in February, lots of white snow in Ohio and lots of white, lilly white, legs here in Clearwater, Florida. We started our morning out at -2 degrees in Dayton, Ohio. Four hours later and we’re sitting in t-shirts and shorts on our hotel patio looking out over the Gulf of Mexico. I think Justice now understands the vacation dance and why I was doing it after work yesterday. I was doing the vacation dance until Jana walked into the house with a very stern look about her, and it wasn’t an “I’m colder than crap” stern look. Turns out the boiler on the furnace blew, it’s going to cost over $500 to fix, we’re about to leave the state for nearly a week, and it’s freeze your face off cold out. That’s okay, we have crusty Lou – he can get into our house without a key and will fix that old furnace. Maybe he’ll feed the cat too. Justice has finally given in to sleep. She tried every trick in the book to keep her head from hitting that pillow, and once her head and that pillow met, she was fast asleep within two minutes. I would say she had a good day. She met all sorts of people and made some new friends. A little poodle named Maggie licked her hand. She helped an eight month old boy, named Brock, stand up. 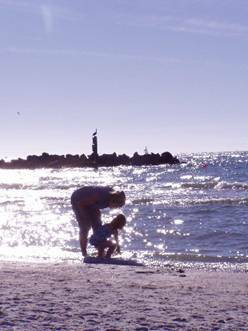 She almost got a timeout for splashing water on a little girl – we’re still learning beach and seawater etiquette. Justice enjoyed her first plane ride and is now a pro with escalators. Virgie (Grandma Darling) picked us up at the Tampa airport and we headed west to the beach. 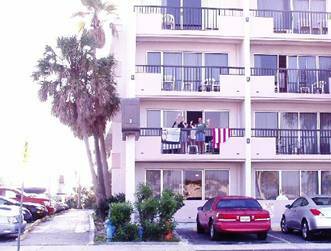 We found ourselves a Travel Lodge with a view of the gulf and across the street from the beach. It just doesn’t get better, folks! 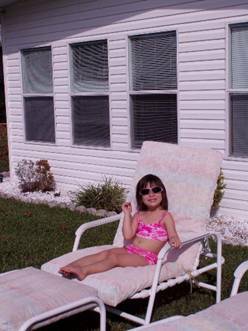 Justice loves the ocean, the beach, the sand, and especially the shells, she and Virgie love collecting shells. “Land Ho!” That’s what Justice yelled when the plane landed. It was pretty quiet, so most of the other passengers enjoyed her announcement of our present condition. Now, not everything went Justice’s way yesterday, she was not happy when the Dayton airport security took her “more than 3 oz” tube of pink princess toothpaste – “it tastes like bubblegum you know”. And everyone who took the time to say hello to a certain little girl knows all about the confiscated pink princess toothpaste. Every time Justice goes to the grocery she asks for one thing only – doughnuts. I’ve never bought doughnuts and I don’t see it in my future. So, this morning, I told Justice that if she got dressed, we’d go down and get a doughnut from the Continental Breakfast. Guess what this hotel has at its Continental Breakfast – honey buns and pastries with jelly in the middle – not a doughnut in sight. So, Justice’s quest for a real doughnut continues. Years ago, while vacationing with young nieces and nephews, my practical mother would buy a cheap stroller as soon as we reached our destination. Since we arrived here at Clearwater Beach, I have been hunting for a cheap stroller. There are no cheap strollers on this island. I’ve hit several of the cheap beach shops where I can buy two t-shirts for the price of one, I can buy beach chairs, suntan lotion, swim suits and towels, but no one has strollers. The most interesting part has been me trying to describe and gesture “stroller” to store clerks who speak very broken English. Try it. Try to describe a stroller with your hands. Setting: The sun is just coming up and spilling into the room through the hotel curtains. Virgie and Justice are in one bed, Jana and I in the other. Everyone is starting to stir. So far today, we’ve been to the continental breakfast – not so sure which continent’s. We spent a few hours at the beach – we buried Justice in the sand, and Grandma Darling and Justice gathered more shells. Justice and I took a long walk, we found a wonderful playground and a lot of boats – all shapes and sizes. We are now hanging around the pool. It’s a good thing we have three adults and one kid, I like the 3:1 odds. We took turns playing in the pool with Justice. I had the shortest Justice pool time, and I waited until all the little boys had left the pool area for lunch. Justice has yet to meet a stranger. And she has yet to learn there are certain things you don’t say to people you know, let alone strangers. In the airport, she asked us what the “old lady’s name with the dog” was, loud enough for the old lady with the dog to hear. She asked “why that lady’s belly was so big”. She just asked an elderly gentleman “why he had a band-aid on his belly” while pushing on the band-aid. Every time we see her make eye contact with someone and her mouth starts to open, we have the half smile with the pinched eyebrows – the, “I’m really sorry before she says it” look. Naomi (Virgie’s sister), Nanette (Naomi’s daughter), and Zack (Nanette’s son) have arrived. Zack is five, so the odds have changed, 5:2. It’s nice to hang out with another kid Justice’s age. It’s nice to hang out with another kid just as hard-headed and independent as Justice. This could be interesting. I’ll just sit back and watch. Nanette, Jana, Zack, and Justice are involved in a highly competitive game of Candyland right now. This afternoon/evening we all headed down the beach to the local, daily, evening festival. There were street vendors, entertainers, musicians, and other stuff. 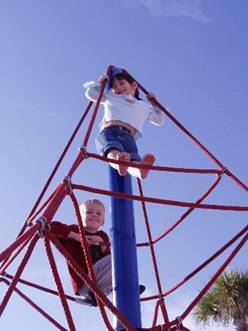 The kids had a lot of fun wearing themselves out on the playground. And the adults had a lot of fun watching the kids wear themselves out. We went out for a wonderful dinner – no wait. Zack fell off his stool three times. It was especially fun watching Jana use the left side of her brain attempting to figure out the bill and tip, glad it wasn’t me. Justice had a great time this evening on the pier. There were many vendors with lots of jewelry – she has an eye for jewelry. Justice and Zack desperately want one of the adults to get in the pool with them. So, the adults are lined up in their lounge chairs facing the sun and the pool, and the two kids are in the pool staring at the adults. I think the most daunting task of going to Florida in February is the packing. It is unfathomable to imagine 74 degree weather while dressed in layers and really thick socks and a turtleneck. I forgot shorts for Justice. Last night, after getting the kids to finally succumb to sleep, we played a very spirited game of Hand and Foot – Naomi style; which means, she pretty much makes up the rules as she goes. It’s a good thing we had Nanette for official rule interpretation. Nanette knows the rules and never wins. Naomi wings it and almost always wins. I always make sure I’m Naomi’s partner. During the course of the evening, Virgie pretty much called me a fat redneck. I can understand the fat part, I’m still concerned about the redneck part. In her initial attempt at explaining Hand and Foot to us, Naomi informed us that red threes are dangerous We’re not sure how dangerous they are, but we certainly make every effort to discard them as soon as possible. I’m fairly certain that these two have been best of friends in previous lives. They are two peas in a pod. And I’m sure that when Justice is Virgie’s age, there’ll be a four year old granddaughter or great granddaughter who brings out the kid in her. Since Nanette arrived she’s been talking about “the best ice cream on the planet.” For future reference, the best ice cream on the planet can be found on Treasure Island, of course, south of Clearwater Beach, near Tampa, FL. For some reason, I was expecting some overrated, pretentious Cold Stone Creamery type ice cream parlor. Silly me, I had briefly forgotten that Nanette has some of that true West Virginia Carr blood flowing through her veins. The ‘Shake Shop’, which really does have the best ice cream on the planet, should probably be called ‘The Shake barely-standing Shack’. It’s like an old Dairy Queen built up high, in case of hurricane water levels. Justice and Jana are sure sawing logs. It’s about 11pm and we left for Disney World’s Magic Kingdom this morning around 10am, after purchasing doughnuts for Justice. We didn’t intend to stay for the fireworks and the park closing, it just sort of happened that way. Justice isn’t 100% healthy. She’s got a cough, gave us a scare last night, she had a fever of 103, and then some, for about two hours. I called Carol Pursley, RN because she knows everything about babies and kids, and she said to let the medicine work and give her some time. Justice slept through the night and woke up feeling great. We thought about putting off Disney to another day, but the logistics didn’t work out. So, we grabbed Virgie, packed a little cooler and went for it. And we so rented a stroller – probably the best $10 we spent all week. Justice spent most of the day in that rented stroller and I hope she got to see more of the park than just knees. We had a wonderful time. In fact we were in a parade right off. We were flag-waving, nerdy Ohioans following Pluto and a red, white, and blue cowgirl. I don’t think they’ll invite us to be in anymore parades, we didn’t really march well, or keep the beat, and Justice poked a few people with her flag – but we had fun and smiled real big. Nothing quite fills a skyline like Cinderella’s castle! It is a landmark that makes you say “Wow” no matter the language. My only concern was that Cinderella wouldn’t be at her castle. 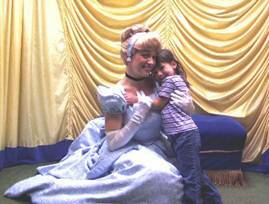 After all, we were traveling with a four year old girl whose absolute favorite, number one, princess is Cinderella. Yes, she’s quite fond of Sleeping Beauty – she wears pink so well. And Justice did dress up as Snow White for Halloween. And Ariel can sing like nobody’s business. And Belle and Jasmine are beautiful with brown eyes like hers . . . . but nobody comes close to Cinderella. We discovered that a few princesses would be holding court and that Cinderella would be one of them. We waited in line for a short time and were ushered into an elegant room. The elegant room had no ropes to keep us in line, it was quiet and there were only about five little girls, and their respective entourages, and there were the princesses. There were three princesses; Snow White, Cinderella, and Belle. Each princess had her own area decorated with fancy, colorful curtains, a couch, and pillows. And each little girl spent as much time with each princess as she wanted. Their dresses were beautiful, the princesses were beautiful, and Justice was in absolute awe. She wasn’t dumbfounded, she could speak. In fact, she carried on a conversation with all three of them. She didn’t want their autograph or anything from them. She just wanted to be in the presence of a beautiful princess and say Hi. Jana clicked away with the digital camera, one tear rolling down her cheek. I might have shed a tear or two as well. I can guarantee Justice gave Cinderella the biggest and best bear hug she got all day. And as we left, Snow White blew her a kiss. We’ve gotten the grand tour of last week’s tornado damage. Justice waited till we were nearly to Gene’s house (Jana’s Dad), and finally asked about “that potato” and what it did to those houses. This has been a lazy day – we were due. Justice took a two hour nap, took a full hour to really wake up, and ate a lot at the Chinese Buffet. Yesterday’s trip to the Magic Kingdom wore us all out. Everything I read said we were going during the least busy time of the year. If that wasn’t crowded and busy, I don’t know what is. The mass exodus from the park was impressive. We had to turn in the stroller at about the point that Justice really hit the wall, so Jana and I traded off carrying her all the way – 30 lbs, I don’t think so. The last sunny day of our vacation and I finally found the sunglasses I knew I’d packed for Justice. Jana and her Dad both took afternoon siestas, so Justice and I took a walk. We waved at every car and golf cart that passed us. We visited with Jack Rindler. He is nearly a celebrity because he is Kelly’s grandpa. He fixed us farmer sodas (Barqs Red Cream soda and vanilla ice cream). And he gave us a bowl of salted mixed nuts, a wonderful salty sweet snack for our afternoon. He also sent us home with his golf cart. I am now sitting on the deck, enjoying a lovely sunset, and watching the wildlife around the lake. Justice is inside the double wide yelling my name. Most everyone in the neighborhood can probably hear her (and yes, most everyone in the neighborhood is hard of hearing). Justice has a set of lungs that rival her Grandma Darling’s. And that is rather helpful when living in a three story farmhouse with 17” thick solid brick walls . . . slight overkill for the double wide. We drove the golf carts to the square. There was shopping and dancing. Justice got a bracelet and some toe rings that fit her fingers. Did I mention she loves jewelry? We hear there’s quite the snow storm going on in Ohio. I dreamt we were dropped off at the end of our lane and trudged through two feet of snow, wearing our tennis shoes and sweaters, hauling the suitcases and the kid on our backs. We dropped Jack and Beth’s golf cart off to them this morning. We stayed and visited with Beth R for awhile. Justice got hold of my pen and drew all over her belly. I was just wondering what to write about next . . .plenty of material with a four year old girl around. It got rather warm late this afternoon, and since I forgot to pack her any shorts, I just threw her bikini on her. Then she was bored with Jana and I sitting in the sun and reading, so I gave her my pen and pad. She decided to forego the pad and drew directly on her stomach. Clearly, there were ink marks all over her stomach, yet when I asked her about it, she said she had not drawn on her belly. I wasn’t going to give her a time out for drawing on her stomach – because giving a bare-belly bored kid an ink pen is just asking for it. But then she had to go and lie. It was a short timeout and she was sorry about the lying and drawing. We can’t complain, she has been a blast to vacation with. We had cheeseburgers by the pool for lunch and got back just before the rain hit. A short rain shower came through, Justice heard us talking about the storm and asked if there would be a potato. She must think Florida has some mean potatoes. Justice is napping and Jana and her Dad are working on his computer. The rain has subsided and all is quiet. We flew out of Tampa airport around 9:30 am and can’t wait to see all the snow and ice we’ve been hearing about. We were sitting in Chilies restaurant last night and two of the four TVs were on the Weather Channel. Usually, when you’re in another state and the Weather channel is on, you see the East coast weather, or West coast weather, or Chicago or New York weather, but you rarely see Ohio weather. And yet there we were on the Weather channel, over and over again. There we were, eating appetizers and discussing 72 degrees, the recent Florida tornado, wondering what in tarnation we were coming home to. Oh well, no sense worrying. Fun vacation! We watched a lot of The Beverly Hillbillys with Grandpa Gene, Justice says he is a crazy guy and a crazy driver. Justice found an old dried up lizard under the bed – the study of which kept her busy for quite awhile. Since we were up at 5:30am this morning, Jana is trying to get some shuteye. Justice is digging into her gum supply to relieve the pressure in her ears. With her ears stopped up, she can’t hear well, so she talks/yells really loud, disrupting all the sleeping passengers. Funny – on the way to Tampa, everyone was so talkative and friendly. On the way to Dayton, everyone is very quiet and dozing off. Must’ve been good vacations all around. We had a great time. We packed a lot in. Jana got to see the ocean. I got to see yellow and purple pansies. And Justice might now understand the Vacation Dance.